This 12-night trip combines rich culture and outdoor adventure. You'll stay in Quito at Casa Gangotena, which won World’s Best Hotel in Central and South America and the eighth-best hotel overall, and then experience a cruise and land stay in the Galápagos Islands, which won Best Islands in Mexico and Central and South America. Book with a Capital One® card, and you will receive a complimentary tour of Casa del Alabado, a museum in Quito. 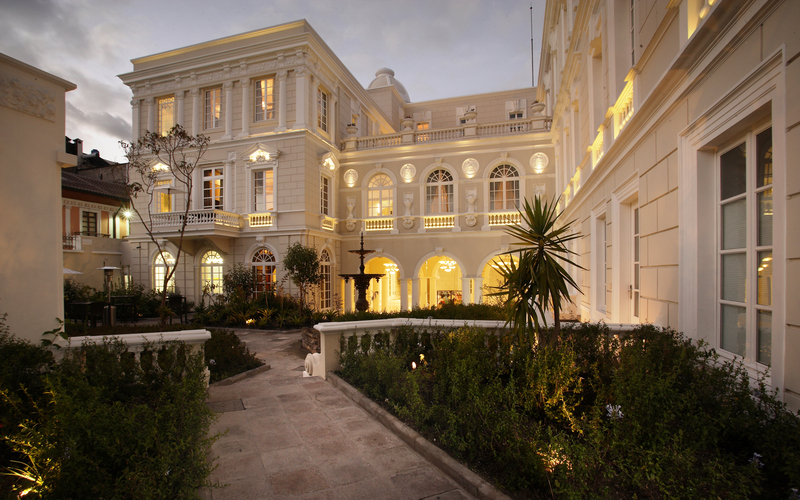 Arrive in Quito, where your guide will take you by car to the Hotel Casa Gangotena. At this romantic property overlooking the Plaza San Francisco, you will enjoy a three-night stay in a luxury double room. Note: Breakfast is included throughout the trip, as are transfers and guides. Unless otherwise noted, all other meals and alcoholic drinks are at an additional cost. 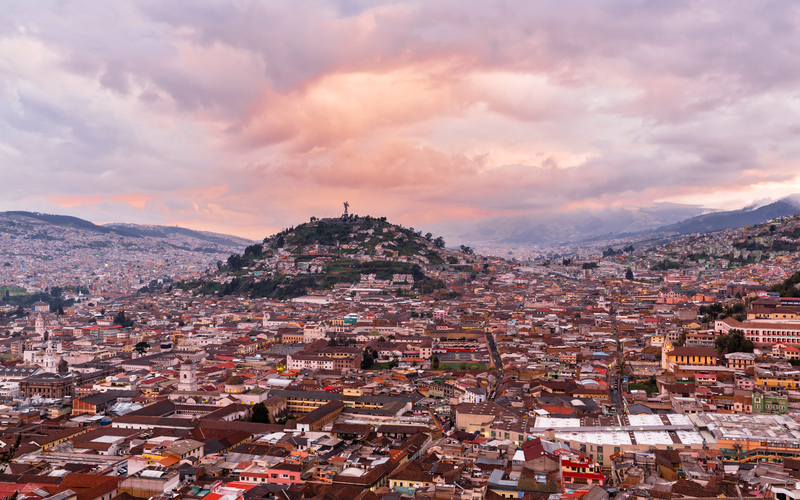 With its magnificent churches and cobblestoned streets, Quito, the capital of Ecuador, has one of the most stunningly preserved colonial centers in all of South America. In 1978 it was declared a UNESCO World Heritage site. Today, you will enjoy a guided walking tour through the main plaza, where you will see landmarks like the Government Palace and the Monastery of San Francisco, which dates to 1534. After, your guide will drive you to Panecillo Hill (Little Bread Loaf Hill) to see the iconic Virgin of Quito statue and enjoy a private picnic lunch. Next up: a chocolate tasting. Your guide will drive you to a tasting room in Quito’s trendy La Floresta neighborhood, where you will learn about chocolate cultivation and production, and taste your way through 10 varieties. A gift box is included as a sweet souvenir. Capital One Cardholder Experience: A guide will take you on a behind-the-scenes tour at Casa del Alabado, a museum in colonial Quito. The museum has an archaeological collection of over 5,000 pieces (500 are on permanent display) that represents almost 7,000 years of native Ecuadorian history. You will also learn about local plants and how they are integral to the life of indigenous people, and used for medicinal or spiritual purposes, and how shamans have been the keepers of this knowledge for thousands of years. Leave Quito for a trip to Cotoxpaxi National Park, which lies just one hour by car south of the city. 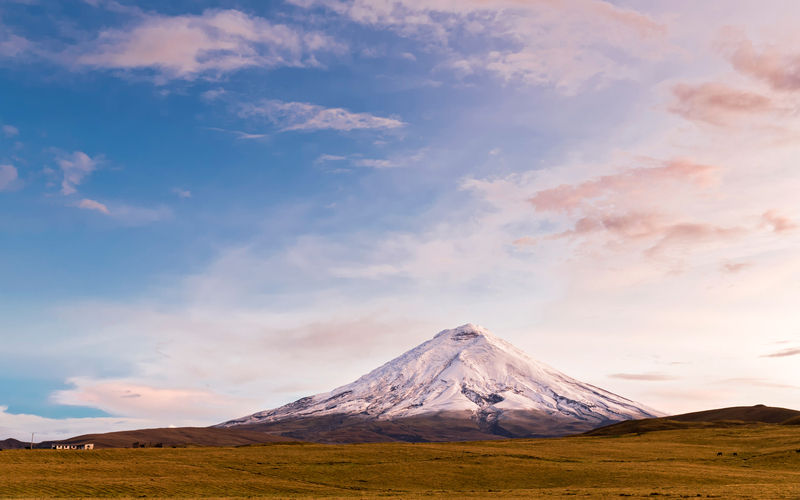 Your guide will take you to the Cotopaxi Interpretation Center to learn about the history of the area’s volcanoes, flora, and fauna. You will then drive and visit scenic Limpiopungo Lake for a walk, and then horseback ride through trails in the Andes and Ecuadorian highlands. Your guide, a “chagra” (an Andean cowboy) may point out local species including Andean birds and wild horses. Lunch is included before your return drive to Quito. Say goodbye to Quito and embark on your next adventure: a visit to the ecological wonderland that is the Galápagos Islands. Your driver will pick you up at Hotel Casa Gangotena and transfer you to the airport in Quito for the flight to Baltra Island in the Galápagos. Upon arrival, you will be transferred to the 16-passenger Ocean Spray for a four-night stay in a double cabin. Note: other passengers will be on the vessel, and it is not a private charter. Meals are included; tips and alcohol are not included. In the afternoon, set sail for Bartholomew Island, home to a variety of green, red, orange, and black volcanic -rock formations. You also may snorkel on the beach and possibly spot penguins. Explore Genovesa Island and Darwin Bay, a white-sand coral beach with a half-mile trail that traces a path through mangroves. Be on the look out for some incredible animal species: Nazca boobies, red-footed boobies, swallow-tailed gulls, and sea lions. At the end of the trail, you will have the chance to snorkel and kayak. After lunch on the boat, hike the trail to El Barranco (also known as Prince Philip’s Steps). Your reward is spectacular views out on to the sea. Explore Santiago Island, starting with Espumilla Beach, a great place for snorkeling and spotting marine iguanas and sally lightfoot crabs. 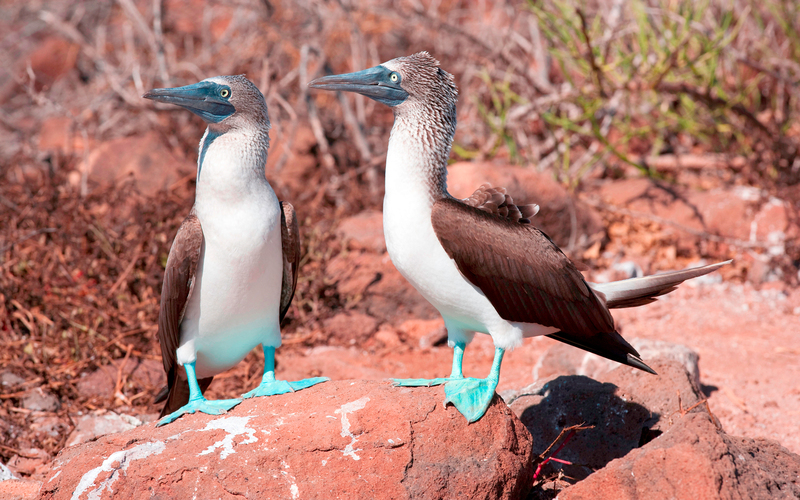 After lunch on board, visit Egas Port, also known as James Bay, a stunning place that is home to species including Galápagos hawks and quick-footed lava lizards. Hike a trail to the coast for more snorkeling in pristine tidal pools. Today you will experience North Seymour Island, which is known for its arid landscapes, windswept beaches, and remarkable bird life. After lunch, you’ll be transferred to Santa Cruz Island, where you will hike to the highlands of Santa Cruz, a lush, green area dotted by scalesia trees. Another surreal experience: walking through underground lava tunnels that are over a half-mile long. Also keep a look out for the giant Galápagos tortoises that make the island their home. In the morning, visit Mosquera Islet, home to one of the largest populations of sea lions. Say goodbye to the ship; take a car transfer; and check in to a double tent at the intimate Galapagos Safari Camp, an African-inspired tented camp located on the highlands of Santa Cruz on Santa Cruz Island. Note: All meals during your stay here are included; tips and alcohol are not included. In the afternoon, you may drive, bike, or trek to a local farm on the property, where lunch is included, and admire Santa Cruz’s natural beauty: lava tunnels, pit craters, and scalesia forests. You may also experience the Tortoise Reserve. Explore the neighboring islands of North Seymour, Bartholomew, Plazas, and Santa Fé by motor vessel. Alternatively, visit Charles Darwin Research Station, a biological research station operated by the Charles Darwin Foundation, where scientists, naturalists, and volunteers study and work to conserve this remarkable wildlife destination. Embark on a guided drive of the eastern part of Santa Cruz Island to the Cerro Mesa Reserve, which provides tremendous views of the largest crater on the island. After lunch, relax on Garrapatero Beach, a lovely stretch of white sand with turquoise water near a flamingo-filled lagoon. You can also kayak the secluded coves. Transfer to Baltra Airport for a return flight to the mainland and Quito airport. From there, you will be brought to the Hacienda Zuleta, a hotel in the Andean mountain range two hours north of Quito, in Otavalo. At this intimate property, which is set on a 4,000-acre working farm, and is run by the renowned Plaza-Lasso family, you will be staying in a standard room for two nights. Dinner—a feast of traditional Andean dishes—and lunch are also included daily. Begin your day with a horseback ride on a Zuleteño horse through the countryside. Lunch will be at the hacienda, followed by a horse-drawn-carriage ride through the hacienda grounds. 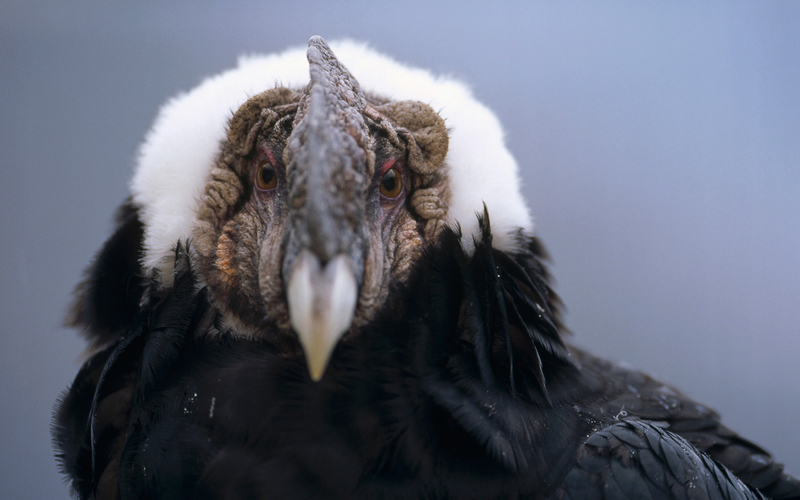 You may also be driven to the Condor Huasi Project, a rehabilitation program for the Andean condor. After breakfast at the Hacienda Zuleta, check out and transfer to Quito for your return flight home. Travel booked and fulfilled through Black Tomato. Specifics of itinerary and perks subject to change and availability. Details to be confirmed by Black Tomato. Offer good for travel booked before December 31, 2016 for travel before June 1, 2017. Capital One card must be used at time of booking to receive Capital One Cardholder Experience. For full trip terms and conditions, click here. Capital One Venture card: credit approval required. Credit card offered by Capital One Bank (USA), N.A.